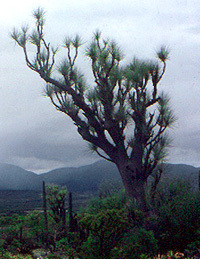 The tree on the middle right is Beaucarnea gracilis. Though they look like Century Plants (Agave), the green, spiky rosettes in the foreground are a member of the genus Hechtia, in the Pineapple Family (Bromeliaceae)! One of the shrubs at the base of the Beaucarnea is a Setchellanthus, a mustard-oil producing plant placed in a family all by itself.